While I have never used 123456, password, or qwerty, the ever growing need for not only complex but independent passwords (unique to account, site, system, etc) keeping track of multiple usernames and passwords in my memory just isn’t possible any more. I have for some time used password managers to keep usernames, passwords, etc., and have been asked by friends and peers what and why I use certain ones. There are many good choices available these days that range from basic, like keeping a word or txt documented list, to complex applications that will populate every bit of information about you (that you give it) into web based forms. I believe most of us are looking for a good middle ground that is easy enough to use that it will actually be used. In my case, I do not care to keep my credit card information in an application to fill out forms for me because I am too lazy to pull out my wallet, a simple copy and paste solution is all I needed. So here they are, what I use, and what I would recommend. 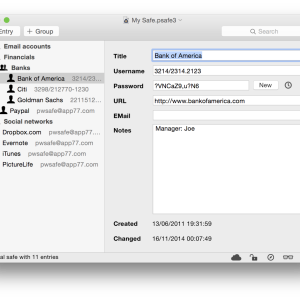 pwSafe became my default password safe for personal use when I started using the iOS version a couple years ago. 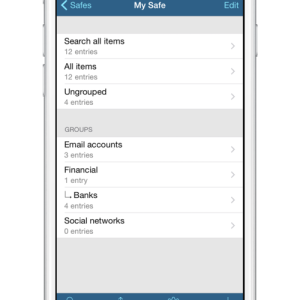 The app has grown positively with great screen support for the iPhone and iPad and using iCloud my safes are available across all my Apple devices. Dropbox support is available with purchase of a plug-in for a couple dollars more (I have never used it) and would allow safe synchronization across platforms. Switching from Windows to Mac at work for my primary computer I simply copied my safes from PasswordSafe my choice for Windows (below) without any problems. 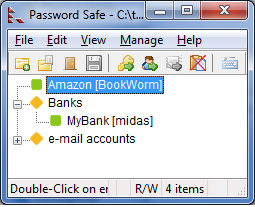 On Windows I use PasswordSafe, the original project that created the database format used by the apps above.